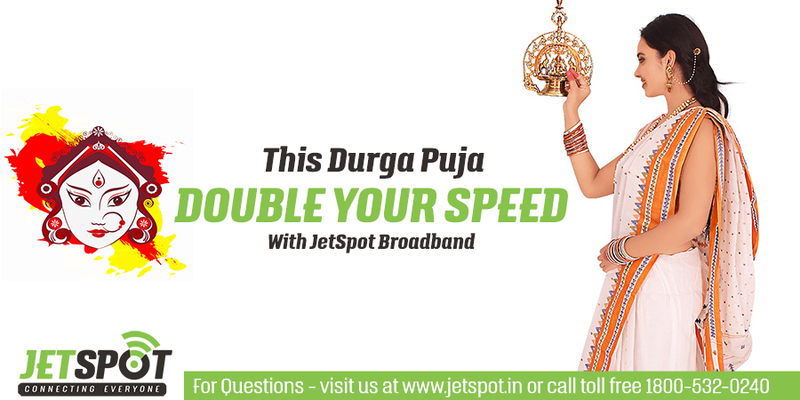 JetSpot Broadband Durga Puja Offer - "Double Your Speed"
THE OFFER HAS ENDED. WAIT FOR NEXT YEAR NOW!! JetSpot, has now come up with a great Durga Puja offer. However, this offer is on promotional basis and for limited to JetSpot existing and new Customers only and it will be active till 22nd October midnight. So, pure 10 days of extreme bliss!! As we posted last month, the Student Plans customer wont be getting any future updates or offers, but we will make them happy for the one last time here! So, all the plans speeds will be doubled from today till 22nd october. Night plan users will see doubled speed, like 2Mbps, 4Mbps, 6Mbps, 8Mbps all throughout the day! Also, those are broadband plans, so the speeds defined are “UPTO”. You are lucky, we have been able to deliver you accurate dedicated speeds, but we dont promise it. So, please dont start calling our customer care and asking why Im getting X Mbps, when my doubled speed is X Mbps. Use the offered free service, without disturbing us! THE SPEEDS WILL BE ACTIVATED AFTER WE RECEIVE THE EMAIL FROM THE BELOW FORM! HOW TO GET THE DOUBLE SPEED ACTIVATED ? We are not giving it for free, you have to reward JetSpot for this good gesture. We are not asking you to pay us, but to spend 2 valuable minutes of yours. The speeds will be activated for all at once, but there is a condition! Once you have done it, fill this form below and we will verify it. Once verified, your speed will be active for next 10 days. And the IDs which we dont get the email from this below form, their speed will be deactivated and back to normal after 2-3 hours today!